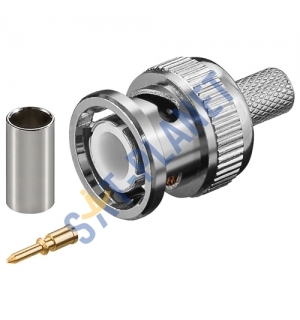 This BNC male crimp two piece connectors is a premium quality product designed to provide a professional and secure connection for RG59 coaxial cable. BNC Crimp connectors are extremely popular for use by professional security installers in CCTV camera, SDI camera, HD-TVI camera, AHD camera, and other video installations. BNC crimp-on connectors provide a secure connection to RG-59 that will last forever when applied properly. PLEASE NOTE: Requires a Crimp tool in order to attach it to cable.